Our 6×24 fibre core galvanized steel wire rope is constructed from 6 strands of galvanized steel wires wrapped around a central fibre core. Each strand contains 24 wires which are made up of 9 central wires overlaid by a further 15 wires. Due to its flexibility and the anti-corrosion properties of the galvanized steel, 6×24 steel wire rope is perfect for use in marine applications where it can be used for all manner of different functions. This includes cargo lashing, fishing/tow lines and mooring lines. 6×24 rope is also often used in forestry applications where its ideal for rope for log lashing, timber harvesting, plantation clearing and reforestation. The steel wire has been coated with zinc, which helps to protect it from corrosion. Although incredibly flexible 6×24 fibre core galvanized steel wire rope has a relatively low breaking strength and fairly short lifetime. The Minimum Breaking factor is K=0.280. Users should be aware that it is also often prone to getting crushed or flattened when bent or spooled in multi-layer. 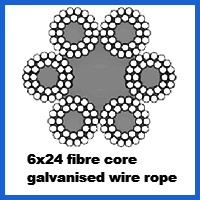 We supply 6 x 24 galvanized fibre core wire rope in a wide range of diameters depending on the type of application you need to use it for. All of our wire rope meets strict performance standards and is of the highest possible quality. For more information on how to order your 6 x 24 galvanised wire rope please give Rope Services Direct a call on 01384 78004. You can also fill out one of our rapid enquiry forms here. 6x24 Fibre Core Galvanized Steel Wire Rope Overall rating: 5 out of 5 based on 6 reviews.